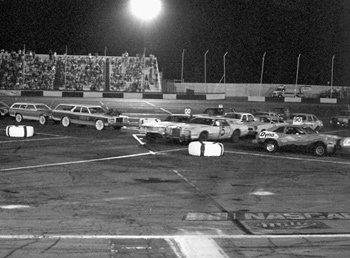 The Saugus Speedway Scrapbook (Later Years) is 288 pages of photos and information, laid out in scrapbook format. All Main Event winners from all divisions are inlcuded along with the top-ten in season points. 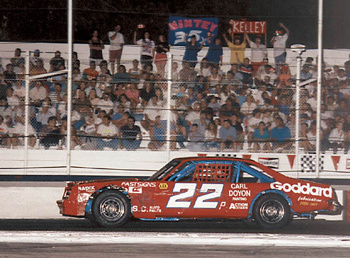 Though closed to racing in an abrupt turn of events in mid-season, 1995, Saugus Speedway nonetheless produced thrills, chills, and a few heroes during its 50+ years of operation. 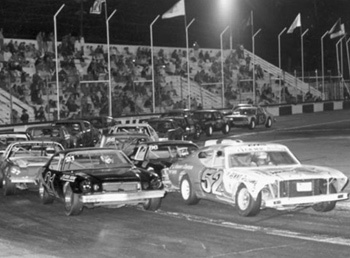 Every year from early April through November, Saugus hosted race events for a variety of divisions ranging from pure stocks to super modifieds. Fans came in week after week, often sitting in the same location each time. They cheered for the good guys and jeered at the appropriate times. They got to know one another, looked after one another, and watch each others kids grow up. Stick around and look at the pictures below. Then order your own autographed copy for only $30, plus shipping. 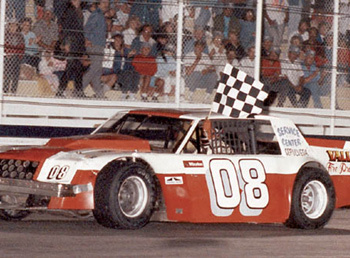 From 1979 through 1995, Dave Phipps collected 58 Main Event wins making him the winningest driver of the era. Phipps drove a couple of different divisions, but found the most success with a Grand American Modified. 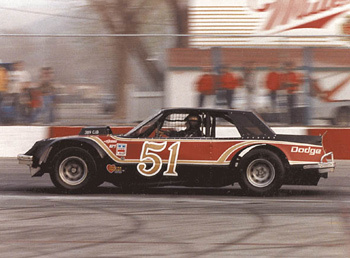 Second generation Saugus driver Ron Hornaday Jr drove everything with a steering wheel and eventually found his way to the Big Show. 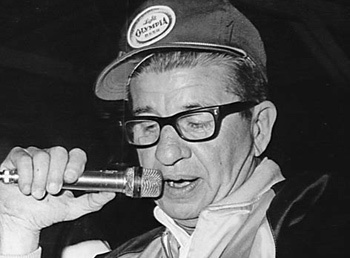 Vernon "Gabby" Garrison was voted Most Popular Driver multiple times. His first race at Saugus was in 1959 with the Pacific Racing Association. Gabby's first win came a year later. He raced every season up until finally retiring from racing in 1986 - at the age of 70! Fanatics abound in the stands at Saugus. Regulars knew enough to bring signs and cheer for their favorites. Racing action was closer to the people in those days and folks felt like part of the show. Here, Brian Kelley is making his way past the turn-four crazies. Dan Press (L) and Jimmy Insolo talking over some race strategy. 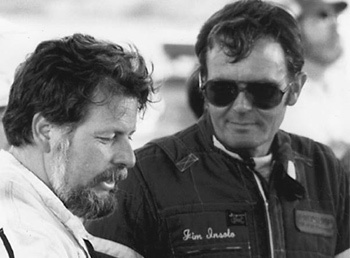 Both are likely saying, "OK, you follow me..." These two men were larger-than-life figures at Saugus Speedway. That's Lyn Pherigo manning the program booth. Lyn produced the best programs around for fifteen seasons at Saugus. 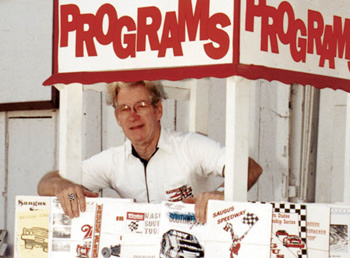 He took pictures, sold ads, published the program, and made sure to spread the word about his beloved speedway. 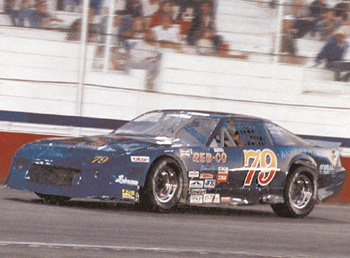 An indispensable part of the operation, Lyn was a fixture at the speedway and devoted his passion to the racers, fans, and happenings at Saugus Speedway. What nut thought this up? Train racing consisted of three cars chained together. The front was the locomotive. The middle was a dummy car with no engine or driver and the rear car had no engine, only a steered caboose. AND they ran on the figure-8 track! Street Stocks campaigned hard year in and year out. Rules called for each car to run both the oval and figure 8 track in order to earn season points. These guys got real good at car control and providing the crowd with some great action. Joe Vollkemer handled most of the announcer duties at Saugus through the later years. His favorite shtick involved mother-in-law jokes. His familiarity with the racers, staff, and fans at Saugus made his job seem easy. A real pro. 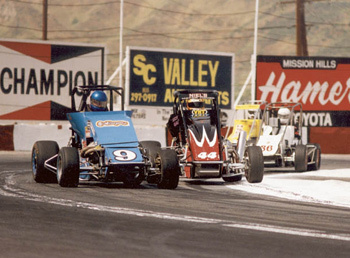 USAC midgets made regular appearances at Saugus. The first real racing held at the stadium were midgets. That was back in 1939. 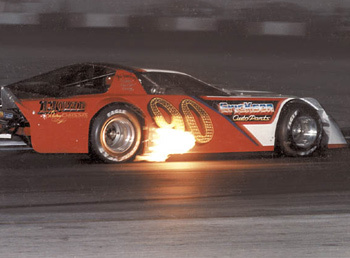 The Southern California annual USAC Turkey Night Midget Grand Prix was won by Stan Fox in 1991. Regulars will recognize this as Richard Aller, otherwise known as the peanut guy. 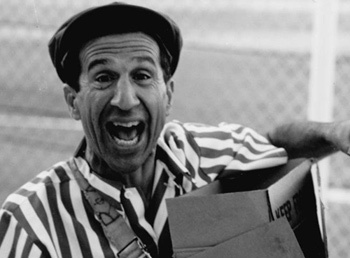 Enthusiastic, always having a good time, and ready to please, he was one of those people that fans came to associate with their favorite Saturday night activity - racing at Saugus. As you let off the throttle, excess fuel gets into the exhaust and POPS out the side. Turn three (and turn one) regulars know this site and sound well. 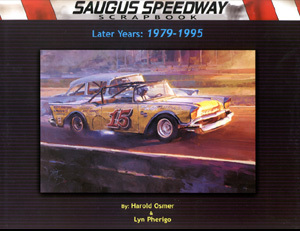 Order your copy of the Saugus Speedway Scrapbook. $30.